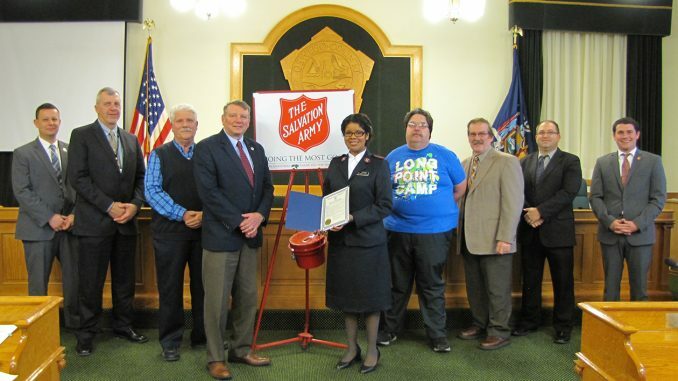 OSWEGO – The Oswego County Legislature’s Human Services Committee joined the Salvation Army to kick off the organization’s annual ‘Red Kettle’ campaign. This year’s goal of $70,000 is needed to maintain services throughout the upcoming year. All money raised will be re-invested into Oswego County communities to provide food and clothing for families and individuals in need. In addition to maintaining their operating expenses, donations help fund the Salvation Army’s food pantries which distribute monthly food boxes, soup kitchens which provide lunches Monday through Friday, and the Christmas Program which supplies food baskets and toys to families and children within the county. 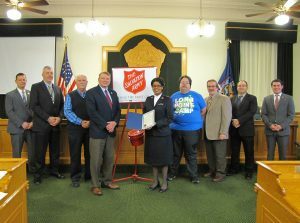 Pictured from left is Tim Stahl, District 20; Committee Vice Chairman Bradley Trudell, District 7; Tom Brown, president of the Salvation Army Advisory Board; Committee Chairman Roy E. Reehil, District 5; Lt. Alberta Rakestraw, Oswego Salvation Army; Arthur Bennett, volunteer, Oswego Salvation Army; James Karasek, District 22; Nathan Emmons, District 15; and Thomas Drumm, District 16. The ‘Red Kettle’ campaign began on Friday, November 16 at the Oswego Price Chopper and other locations. And, on Friday, November 23, at the Oswego Wal-Mart. For more information about the Salvation Army, to donate, or to volunteer at a kettle location, call 315-343-6491.